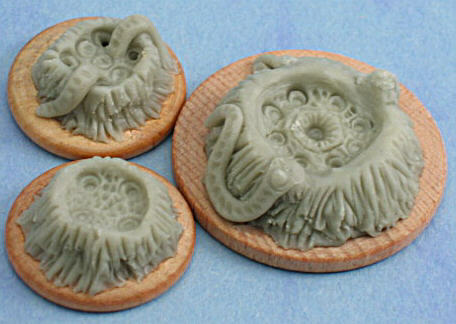 Picked up the new Ruined Fieldstone mold from Hirst Arts at Gen Con. After a week of casting, I finally have enough bricks to start building. The most interesting parts on this mold are the 2.5 inch arch and the pillar pieces. 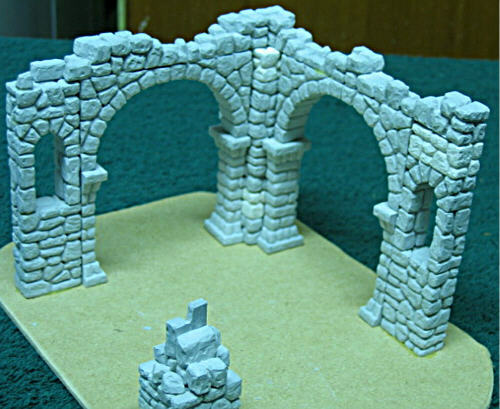 The arches use a new 3D connection point – makes the arch much easier to glue & keeps the bricks at the proper angle. The ruined stones are interesting, but I’ve been able to ruin fieldstone with a bit of work. 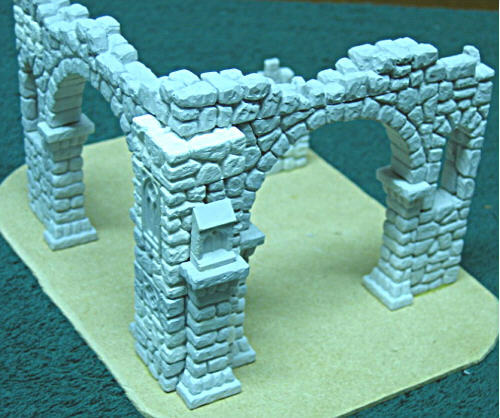 Cleverly, the ruin pieces stack on each other to create intact bricks. The only downside to the mold is the number of casts needed to complete a project – each size of brick has only one socket on the mold. 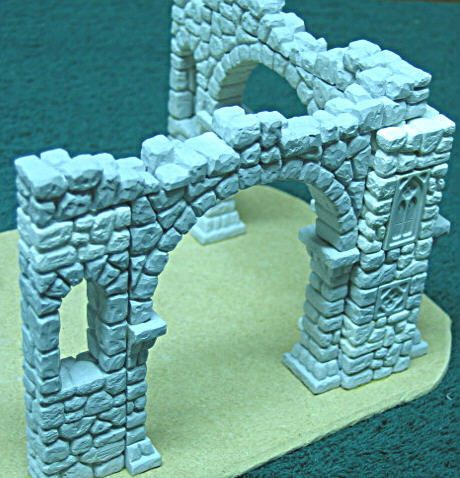 After building a “ruined” set of arches, it dawned on me that the structure is not all that ruined. What’s missing is any sort of ruin along the height of the walls. 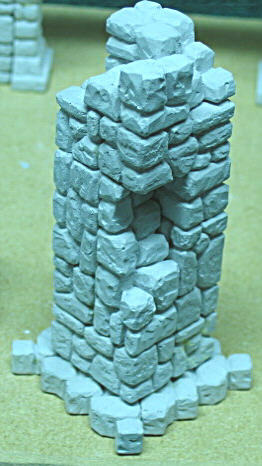 The fourth pic is an attempt to build the ruins vertically. Aside from a bit of sanding, the bricks also work well as worn or damaged spaces in a wall. Bio leaching, DNA stealing, blood sucking alien invaders have landed. And I owe it all to the fact that I can’t sculpt fire. One part of trying to scratch build everything is learning new things. Some times, those new things don’t come easy or at all. But while forming a shapeless lump that should have been an engine fire, I uncovered a technique that made for a rather neat organic effect. The marker on the left was the origin of the alien markers shown above. Begin with a lump of Apoxie Sculpt. Smooth down the edges with a broad headed sculpting tool and form a bowl in the center. Cut up the edge with a sharp edged tool such as a needle. Round suckers are made from a 1/8 tube with a small impression within the circle. The small impressions on the tentacles were formed using a 2mm crochet hook. One final lesson learned – Apoxie Sculpt has an active life of about 20 minutes, after that time the Apoxie no longer cuts when pressure is applied and responds by moving away from pressure. Apoxie is still fine to do large, terrain type work with for about an hour or more but will not respond well to small detail work. In comparison, green stuff/ProCreate is good to work with for more than an hour. A five-hour whirlwind tour of the Gen Con vendor hall. This Saturday marked my very first Gen Con. Over all, I expected enormous event but instead found the convention to be merely huge. 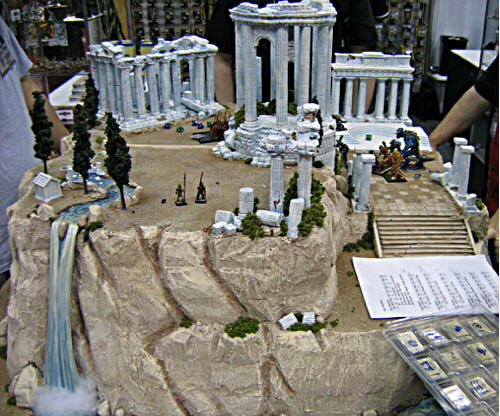 As you can tell from this blog, my interests run to war gaming, miniatures, terrain, resin, and sculpting – most of these areas were underrepresented in the vendor hall. The majority of the vendors catered to RPGs and CCGs, fortunately, I’ve enjoyed these genres in previous gamer lives. Finally, I was surprised by the number of costume & weapon sellers – never realized that Gen Con was such a draw for dress up. 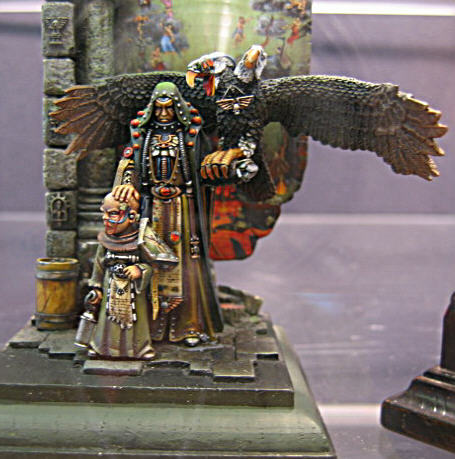 The big find for me was Wyrd Miniatures. 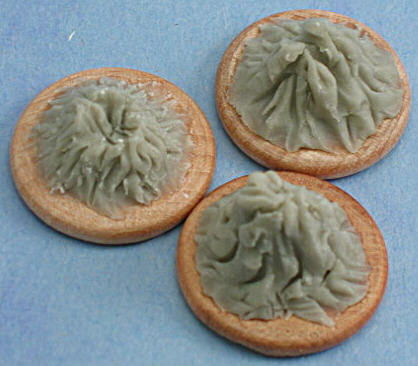 Their miniatures were familiar to me, but I had not given them much thought until seeing the figs in person. Their prices are reasonable too, the pics below left was only $6.50. Aberant Games was a pleasant find. I liked a number of their figures, but was disappointed when the figure I wanted was part of a $30 box set. They have Saga – a Conan style fantasy game coming out soon, which should be a good source of human fantasy figs. I could not pass on the opportunity to drop by the Hirst Arts booth. 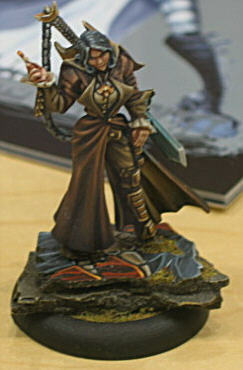 I wanted to meet Bruce & thank him for his support of the Adepticon Hirst Arts seminars. 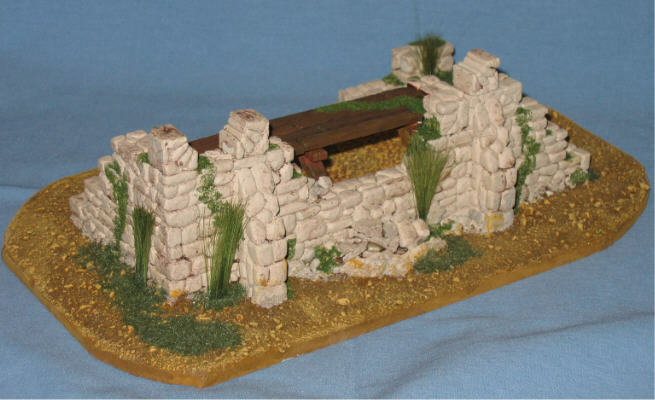 Also, the new Ruined Fieldstone mold is out – lucky me, I was able to buy the last one right off the display table. Other random coolness: Picked up ProCreate from a Kraftmark rep working the paint and take. Ninja Magic was there with both their space ship figs & their magnetic connecter system. The new 40K RPG is due out Spring 08. Apparently the due date was pushed back when a third author was added. I have a mini-adventure book – the stats look a lot like the INQ game. Dark Age was there – unfortunately all of my pics failed to come out. In addition to evaluating the products for sale, Dan (friend of mine with an eye for design) & I had great fun in evaluating the presentation of the booths themselves. Many sellers need to focus on their sales efforts – on more than one occasion we were forced to ask what the vendor was selling because the booth flash was confusing or incomplete. 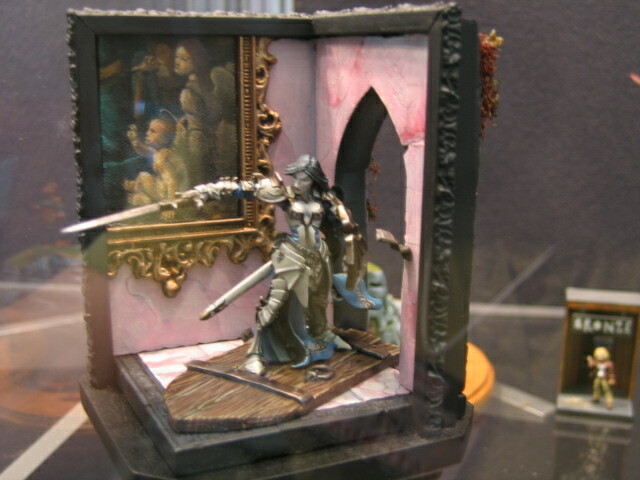 Best Booth: Privateer Press did an excellent job of presenting their wares. 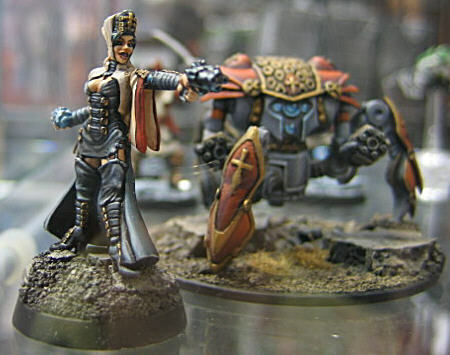 The sales area contained 6-8 demo tables, a wealth of staff, many painted figure examples, a painting contest, accessible product and a central information booth. Now I just need to find those pirate figs they had in the display case. EDIT: make that Sea Dogs. Worst Booth: Rackham was a mess with just three demo tables, only a handful of painted figures & product hidden in the back corner of their area. 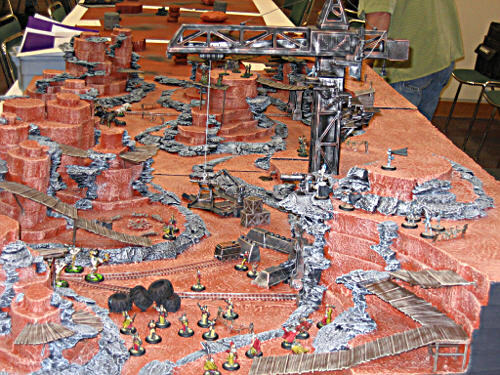 This is a company that wows me every day on line, but all the super cool painting and exceptional terrain must have been left in Europe. Honorable Mention Worst Booth: Somebody is learning how to throw money away on RPGs. This booth took up an entire row, featured 2 actors in high quality Angel/Demon costume and a full-length professional backdrop. But their whole sales effort were two staffers doing demos with non-descript figures on a generic square grid. No sales material was available & the staff was busy running demos. You notice I don’t include a company name or link- I never did learn who they were or what the name of the product was. Meta Gaming Two vendors were on site to help gamers turn their own games into reality. Lulu is a print on demand publisher – here is your chance to publish a book, one customer at a time. Toy Tech is a Chinese game manufacture that can create cards, board games and tokens. 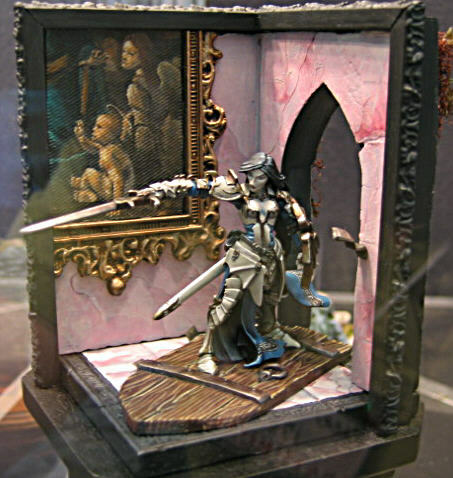 Figures from the Gen Con painting contest. Gaming tables that caught my eye. Completion of the Blast Wall project. I attempted to detail the plane plastic card wall using Apoxie Sculpt cut with water in a similar fashion to how UltraWerke uses green putty and acetone. Unfortunately, the Apoxie would not dissolve in water despite how mushy the epoxy may become in the presence of H2O. Plan B was to use Foam Coat from Hot Wire Foam Factory with a bit of play sand. The mix was applied in a very thin, watery coat to the smooth surfaces of the blast wall. Once dry, the sand/plaster mix added a concrete type finish to the model. I would have preferred the epoxy finish because when a mold is created from this item, most of the plaster detailing will stick to the RTV, requiring a bit of re-detailing if a second mold is made. 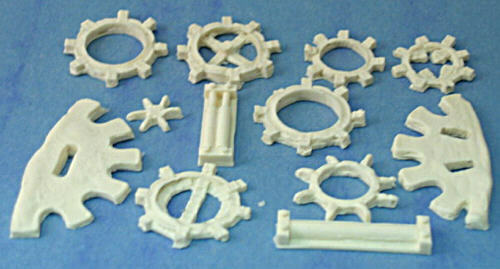 Gear & Piston Basing Kit for use with 40K, WarMachine, AT43 and other miniature gaming figure bases. 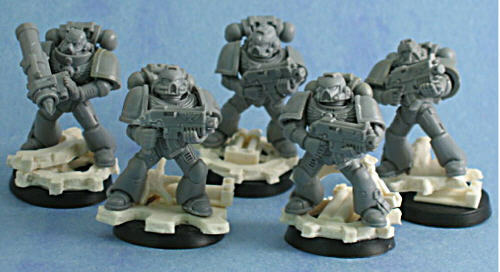 Each kit contains 12 resin cast-basing pieces, which are applied ad hoc to manufacture supplied bases. Now each figure can have a unique presentation, adding character and interest to individual bases. One of the requirements of the up coming Enemy of My Enemy 40K tournament is an enemy unit for my IG army. 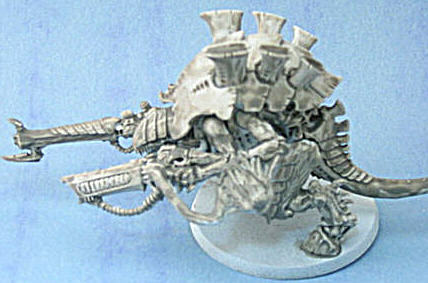 Stubby is configured as a Gun Fex with a Venom Cannon and Barbed Strangler to stand in for a standard Leman Russ tank. 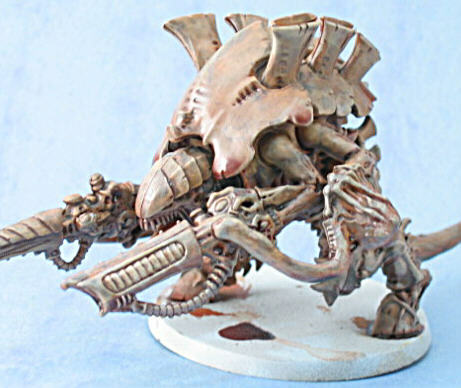 GW saw fit to place both of the heavy guns on the right hand side of the model, making a conversion mandatory. The trick is to use opposite side arms from something useless like death spitters or scything talons to move the barbed strangler gun arm to the left & the venom cannon feed arm to the right. A bit of hacking & green stuff & Stubby is ready to go. Because Stubby will part of the heavy support unit, the Fex will get the same paint job I use on my heavy armor. The list below runs contrary to most methods of painting & the first few steps will look rather poor- but follow the process thru to the end. The poor quality coverage of the craft paint over the white is an important step. 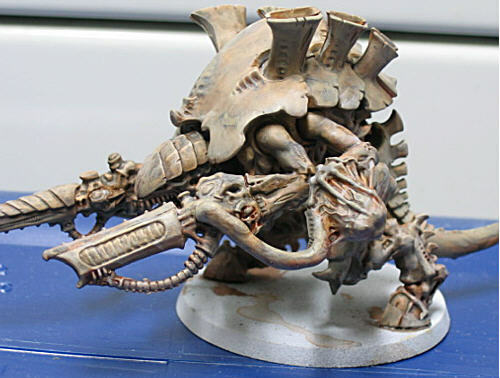 Use a lot of water in this process and the paint will leave large, splotchy patchs all over the model. The following ink wash and dry brush will blend the spots in with each layer. The end product is a smooth & realistic base coat without the uniformity of a scale paint job. The dry brush step did not work out as planned. On the flat armored plates of a tank, the light gray smoothes out the rough spots and calls attention to the edges of the armor. 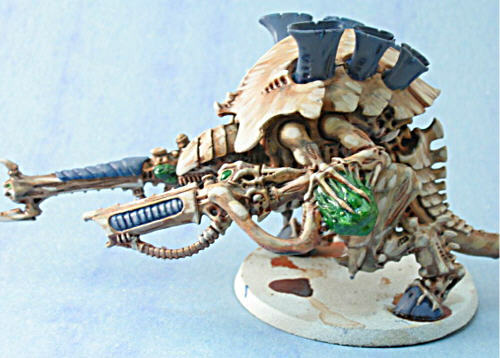 On the Carnifex, nothing is smooth – the whole model is covered in organics, and the grey dry brush coats every in a light chalky finish. 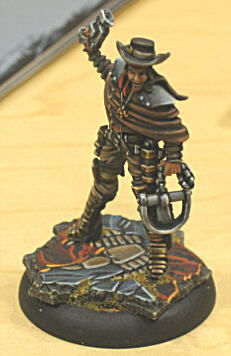 Solution: pull out a bottle of Dirty Dark Brown Wonder Wash & re-ink the model to try and re-establish the shades. The wonder wash successfully re-sets the model to the pre-dry brush state by restoring shade and definition. Overall, an excellent example of how a wash can save your fig after a painting mistake. Since dry brushing was not going to work, the much more tedious method of layering is used. Layers of Kommando Khaki (GW) and Sky Grey build up the final color. 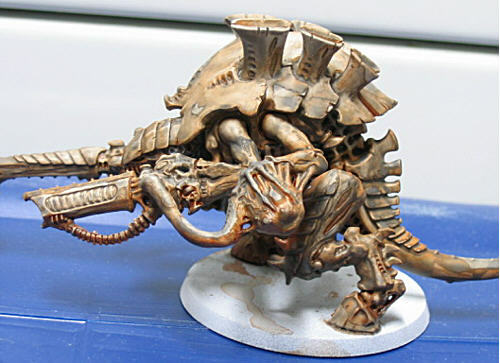 With the base coat complete, details of Shadow Grey (GW) and Goblin Green (GW) can be added to complete the paint job. Apocalypse is coming in October & that calls for bigger guns. I’ve been hanging out at Work in Progress way too much lately & the folks there have filled my head with ideas of scratch built tanks. 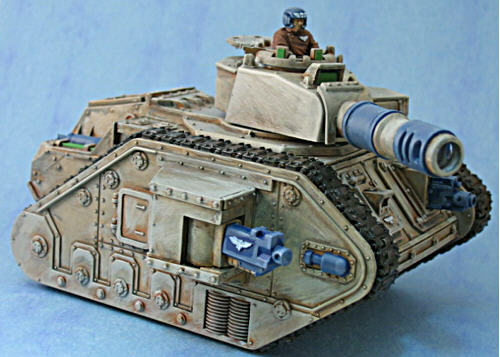 Most scratch built tanks are either GW clones or some sort of real world want to be. 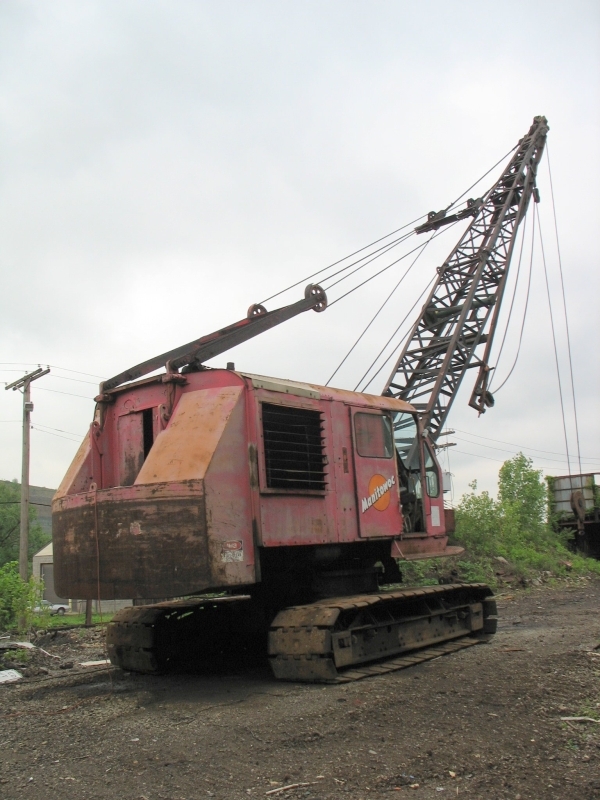 My plan is to come up with something completely different – based on construction equipment! 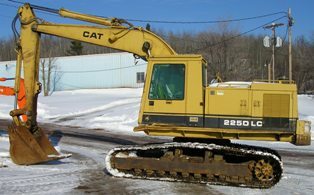 Ever look at an excavator? It’s a pair of tracks with a superstructure hanging in-between & a big rotating turret on top. 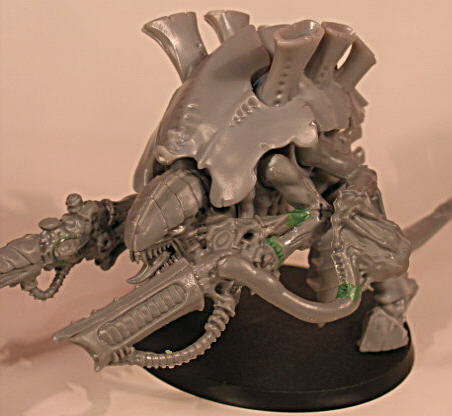 Not a very practical military design – but then the 40K universe has never been accused of being practical. 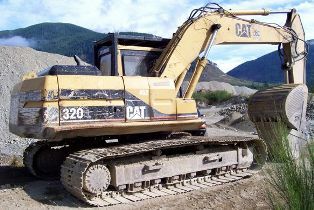 Step 1 is to build up the track bodies. The tracks themselves are in route from Tower Hobbies, two sets of Academy Plastics 1/35 Tiger I Treads should be more than enough. Keeping with my normal desire to mold everything, once 1 track body is built – I’ll create a 2 part mold & bam, crank out all the copies I need. Great plan, but it’ll be my first 2 part mold and the masters will have a lot of delicate detail. Lots of ways for this to go wrong. Hope I don’t need to start pressure casting. Step 2 is to throw together a super simple superstructure to hold the track bodies together, then add a super sized gun turret on top. (Other wise known as, I have a plan for the tracks & I’ll wing the rest.) 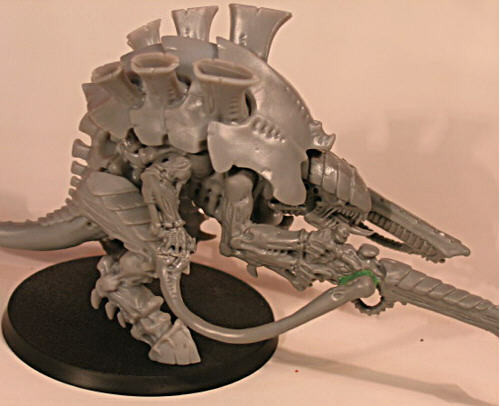 I have an order of magnets coming in a few weeks, I can see it now – detachable weapon pods, even a whole train of tank bodies strung together by little magnets. The last bit is, who are the tanks fighting for? The tanks will look archaic which suits both IG and CHAOS. Not quite sure which side will get the nifty new tanks….. Probably will depend on how noticable the air bubbles are!